Stirling is a city in central Scotland. The market town, surrounded by rich farmland, grew up connecting the royal citadel, the medieval old town with its merchants and tradesmen, the bridge and the port. Located on the River Forth, Stirling is the administrative centre for the Stirling council area, and is traditionally the county town of Stirlingshire. In 2002, as part of Queen Elizabeth II’s Golden Jubilee, Stirling was granted city status. Its Castle and Old Town meet the cutting-edge culture of a contemporary University city. Stirling is well located in central Scotland being almost equidistant between Glasgow, Edinburgh and Perth. The city benefits from good transport links to include a mainline railway, bus depot and easy access onto the Motorway network. The subjects are located on the north western side of Morrison Drive at its junction with Clark Street. It is located within the Bannockburn area of Stirling in close proximity to local high school and with a high resident population. The subjects comprise a detached single storey property of brick construction surmounted by a flat roof overlaid in bitumen felt. 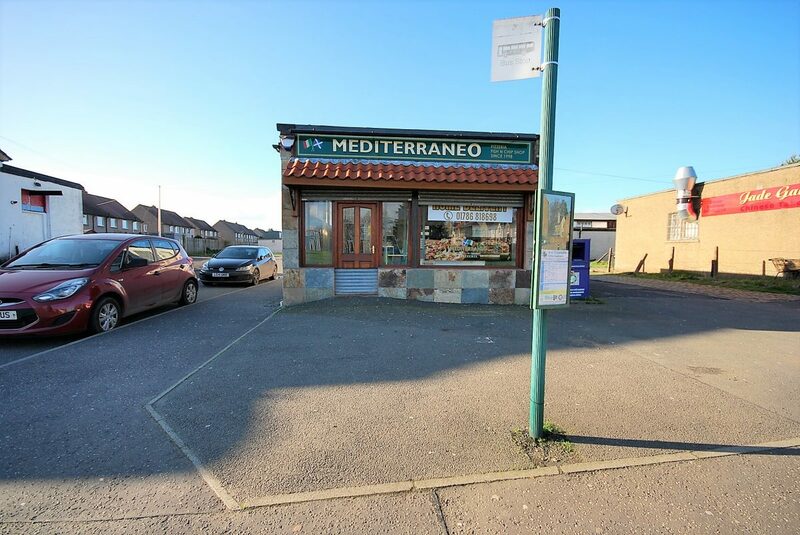 Internally the property provides front take away area incorporating range, extraction system, pizza ovens and other commercial appliances. The floor is overlaid in a ceramic tile covering whilst the walls are overlaid in PVC sheeting and the ceiling is of suspended tiles. To the rear of the property is a food preparation area, store and w.c. The food preparation area benefits from stainless steel appliances and stainless steel wash basins. Externally the property benefits from a good level of free unmetered parking. Rent from £13,000 per annum. A £5,000 rental deposit will be required. Parties interested in purchasing the Heritable property are encouraged to contact us to discuss pricing. The current rateable value is £4,350. Qualifying businesses will be able to benefit from 100% rates exemption subject to application. The subjects benefit from appropriate planning permission for their existing use as a hot food takeaway. All queries in relation to planning permission and use class of the subjects should be addressed to Stirling Council Planning Department. A closing date may be set and all interested parties should make a note of interest at the offices of the Sole Agent. We reserve the right to lease the property without setting a closing date and we are not obliged to accept the highest or indeed any offer for the lease of the property. VAT will be payable where applicable.